Here is my review of a new book on the Zahiri school of law, commonly called “literalist” but better described as “textualist” according to Amr Osman. Unfortunately, I found that the book suffers from numerous problems, which are documented in the review. David R. Vishanoff. 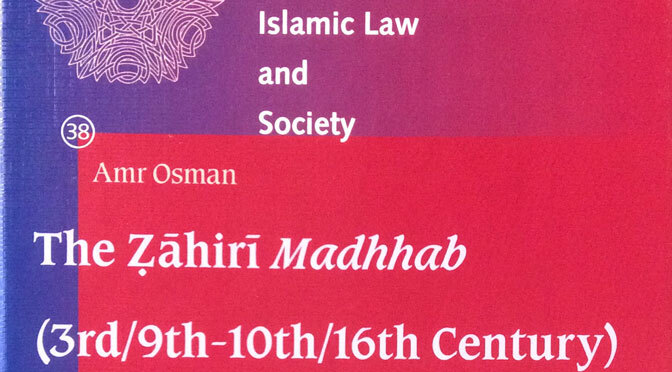 Review of Amr Osman, The Ẓāhirī Madhhab (3rd/9th–10th/16th Century): A Textualist Theory of Islamic Law (Leiden: Brill, 2014). Der Islam 93 no. 2 (2016): 603–609. Given the negative nature of the review, I do not wish to distribute it widely, and so will not post the full text here. It is important only for those scholars who are considering making serious use of Osman’s book.